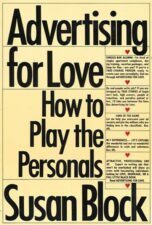 Advertising for Love predicted the online personal advertising revolution, and it’s still the very best guide to finding love and lust through advertising anywhere. All of Dr. Suzy’s wit, wisdom, experience, examples, and advice still make Advertising for Loveindispensable for anyone interested in posting, answering, or just checking out all the different types of personals on the Internet. Plus hilarious Bloom County cartoons! Limited softcover copies available.